The Theological Basis of Liberal Modernity in Montesquieu’s "Spirit of the Laws"
Hannah Arendt’s last philosophical work was an intended three-part project entitled The Life of the Mind. Unfortunately, Arendt lived to complete only the first two parts, Thinking and Willing. Of the third, Judging, only the title page, with epigraphs from Cato and Goethe, was found after her death. As the titles suggest, Arendt conceived of her work as roughly parallel to the three Critiques of Immanuel Kant. 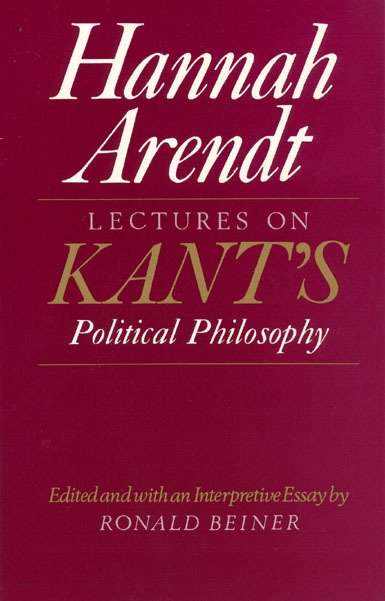 In fact, while she began work on The Life of the Mind, Arendt lectured on "Kant’s Political Philosophy," using the Critique of Judgment as her main text. The present volume brings Arendt’s notes for these lectures together with other of her texts on the topic of judging and provides important clues to the likely direction of Arendt’s thinking in this area.